Today, many innovative responses to global challenges are developed by countries from the Global South. Productive knowledge transfer can no longer be conceptualised as a North –South process, but requires new forms of global cooperation. South–South arrangements enable countries from the South to learn from each other and to develop policy responses that fit better with their needs. The ILO is committed to the further promotion of South-South and triangular cooperation. Within these efforts it supports the work of the Global Labour University (GLU). The active role of labour organizations in Brazil, India and South Africa in shaping the future of their societies is an inspirational source for new ideas and reverberates in the global South. 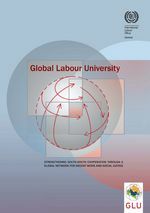 The GLU as a network offers global cooperation between trade unions and academic institutions, with a strong focus on South-South cooperation and creates new channels for trade unionists and researchers from the South to engage in global debates on labour issues. To strengthen these network activities the ILO is sponsoring four scholarships at the GLU campuses in Brazil and South Africa specially dedicated to further strengthening South-South cooperation. Applicants are requested to submit an outline for a research proposal focussing in particular on experiences, challenges and opportunities of South-South cooperation between trade unions and other workers’ organisations. Within the programme they will in particular have the opportunity to look at the role of developing countries in global supply chains, the role of labour standards in South-South relations, best practice in information exchange, policy coordination and solidarity among developing countries.